News Room : eBooksBridge, Your source for downloadable ebooks on Contract Bridge. We're sad to announce that author Ken Allen passed away, on May 24th, 2018, after a determined struggle with Parkinson's. An exceptional bridge player and bridge mystery author, he will be missed by us all at Master Point Press. The American Bridge Teachers' Association presents a series of awards recognizing excellence in instructional bridge writing. This year a number of Master Point Press titles and authors were awarded and we couldn't be more proud. Congratulations to Barbara Seagram and David Bird for their 2018 ABTA Shirley Silverman Book of the Year Award for Planning the Play: The Next Level. The Shirley Silverman Book of the Year Award is for the beginner/novice category. This year we're excited to congratulate Jeff Bayone for winning the first-ever Newcomer Book of the Year Award for A Taste of Bridge. This new category focuses on excellence in bridge writing for newcomers. Mike Lawrence was awarded the intermediate/advanced category award for his book Judgment at Bridge 2, published by Baron Barclay. Larry Cohen's Larry Cohen Teaches Bridge, the Video Series, was award the Technology of the Year award. 2018 Award Committee members were Sam Marks, Henry Meguid, Brenda Montague, Karen Walker and Pat Harrington (chair). Everyone at eBooksBridge.com wants to wish a happy Congratulations to Henry Meguid on his win this year. He was presented with the crystal plaque and check at this year's American Bridge Teachers' convention in Atlanta. Master Point Press is proud to support the ABTA with this award, which recognizes excellence in teaching, a pursuit so important in sustaining the game and helping it flourish. July 19th, 2018: Close Encounters Book 1: 1964 to 2001 and Playing 2/1: The Rest of the Story shortlisted for the 2018 IBPA Book of the Year Award! We want to wish a happy congratulations to Bill Treble for his win. The American Bridge Teachers' Association presents "Bridge Book of the Year" awards for beginner to intermediate-level players and advanced-level players. To read about the award ceremony visit bridgeblogging.com for some great pictures and more. About Defending at Bridge: A First Course: Just the facts, ma’am. The basics of defense at bridge in eight short, clearly explained lessons, with lots of practical examples. Topics include opening leads, signaling, second- and third-hand play, and discards. Defending at Bridge: A First Course is the first of two in the series. Two-over-One: A First Course covers all aspects of switching over to a 2/1 Game-forcing approach. I'm sad to announce that David Silver passed away on February 23, 2017, after a short battle with pancreatic cancer. He was a man of wide-ranging interests who will be remembered by many students from his forty-year career teaching literature at Seneca College in Toronto. He was a collector of rare books and first editions, and loved poking through flea markets and used book stores for undiscovered treasures. He enjoyed squash and tennis, and after retirement took the opportunity to travel widely. He had a quick and ready wit, and could never resist an apposite one-liner, even in social situations where the habit occasionally came back to haunt him. However, his life-long passion was bridge, which he played at an expert level and in which he achieved many tournament successes. In typical self-deprecating fashion, he claimed to have partnered every great player of his generation – once. David's own writings reflected both his love for bridge and his knowledge of literature. His five published books featured his alter ego, ‘Professor Silver', in humorous pastiches of everything from Sherlock Holmes and Joseph Conrad to The Maltese Falcon and Douglas Coupland, all somehow made plausible in a bridge setting. His readers often had difficulty distinguishing between the Silver of fiction and the man himself, and he told me of many occasions on his travels where he had been addressed as ‘Professor Silver' and asked to play, or to solve some abstruse problem. For the past few months, he had been working on a sixth book, which unfortunately will now never see the light of day. Roy Hughes, author of The Contested Auction, discusses his influences, his experiences in world championship bridge, and some of the challenges facing modern partnerships. We send our well deserved congratulations to Julian Laderman as this year the International Bridge Press Association presented him with the Alan Truscott Memorial Award for his book Bumplepuppy Days. 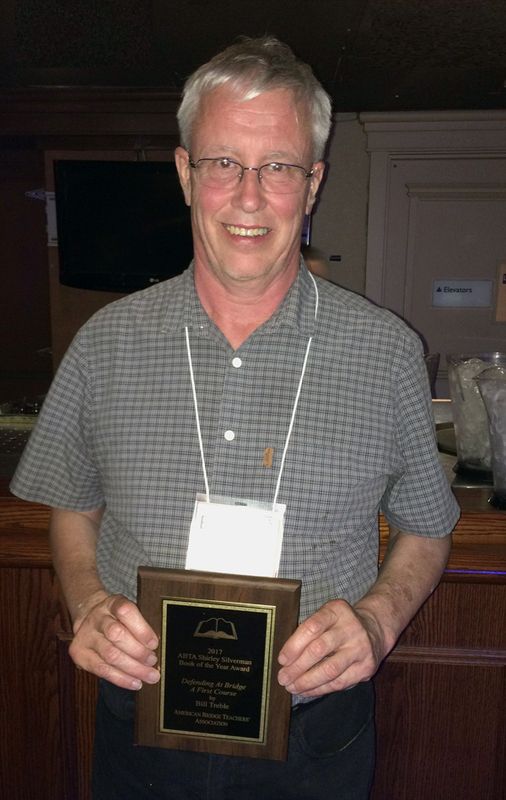 The Alan Truscott Award is presented periodically to an individual or organization that, in the opinion of the IBPA Executive, has done something in the world of bridge that Alan would have approved of and appreciated. Alan was an IBPA Executive member, serving as its president from 1981 to 1985 and was the long-time bridge editor of the New York Times. Well received by many critics, Bumbplepuppy Days traces the development of the game of bridge and demonstrates how the worlds most popular card game came into being. 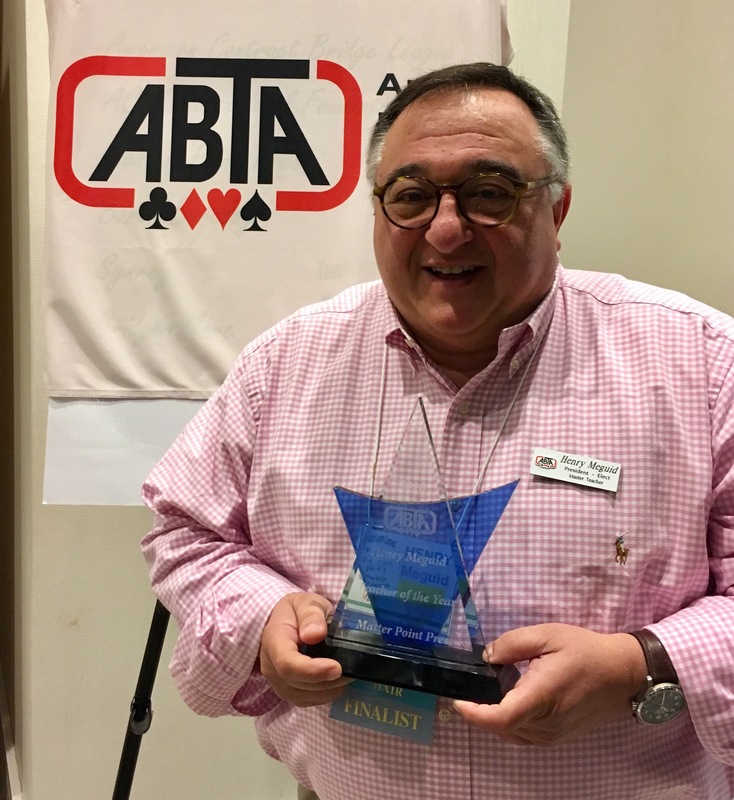 Congratulations go to David Bird and his book Winning Duplicate Tactics for winning the 2015 American Bridge Teachers' Association Intermediate-Advanced Book of the Year Award! The American Bridge Teachers' Association also presented Julian Laderman with a Special Recognition award for Bumblepuppy Days: The Evolution from Whist to Bridge. A special mention goes to Barbara Seagram and David Bird's Bidding at Bridge: a Quizbook, nominated this year for the ABTA Book of the Year Award. 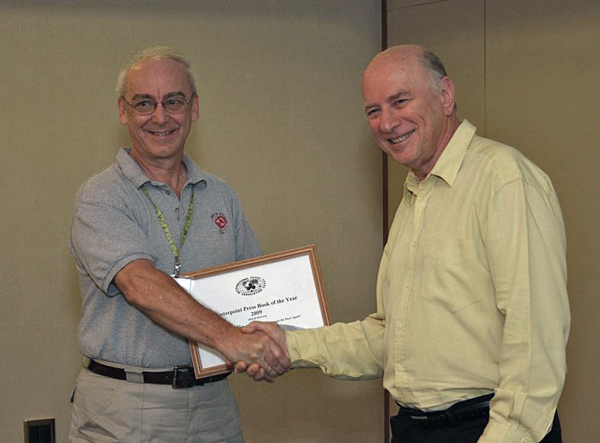 On Monday, September 7th, 2009 at the World Bridge Team Championships in SÃ£o Paulo, Brazil, the International Bridge Press Association presented one of the two awards for Book of the Year to author Ron Klinger. Right Through the Pack Again by Ron Klinger (Orion) has won the award jointly with North of the Master Solvers' Club: The Bridge Writings of Frank Vine (Master Point Press). award to one of the two joint winners, author Ron Klinger. Photo courtesy of duas fotos. For more information, visit Linda Lee's blog. Have you heard the recent news from the International Bridge Press Association? North of the Master Solvers' Club: The Bridge Writings of Frank Vine has tied with Ron Klinger's Right Through the Pack Again to win the IBPA Book of the Year award for 2009. Read Linda Lee's blog for more information. Master Point Press is proud to sponsor the Canada Master Point Press Women's Team at the 2009 World Bridge Championships in SÃ£o Paulo, Brazil this August/September. Master Point Press is pleased to announce that A Bridge to Inspired Declarer Play has been named the ABTA Book of the Year award for 2009. The American Teachers' Bridge Association made the announcement on July 23rd at the ABTA summer conference in Washington, D.C. Julian Laderman is a New York math professor who writes a regular bridge column in The Bridge Journal. His first book, A Bridge to Simple Squeezes, was also named Book of the Year by the American Bridge Teachers' Association in 2006. July 18th 2009: Bridgeblogging World Championship contest! This August and September, Bridgeblogging.com is holding a contest to pick the winners of the Bermuda Bowl and the dâ€™Orsi Senior Bowl. Everyone who enters will receive a $10.00 gift certificate, plus the two winners will each receive their choice of one of five books. Visit www.bridgeblogging.com for complete details. March 25th 2009: The Aces on Bridge column goes live! The Aces on Bridge column by Bobby Wolff, which is a daily bridge column that has been appearing daily for over 25 years, is now available online at http://aces.bridgeblogging.com. The column is syndicated by United Feature Syndicate in more than 130 newspapers worldwide. All columns appearing online are posted at least two weeks after the original printed date. Over 30 titles published electronically, including free and out-of-print titles. Read the press release for full details. Master Point Press is proud to sponsor Canada's Youth (under 28) team in the World Mind Sports Games in Beijing this October. From left to right: Team Captain Michael Yuen, David Grainger, David Sabourin, Erin Anderson, Matthew Mason, Roy Yang Li, and Kai Zhou. Good Luck team! The USA team, including 77-year-old Marshall Miles, this week won the World Senior Bridge Championship in Istanbul, overtaking the Netherlands in the very last round. Miles has many national titles in his distinguished career, but this is his first world title. Master Point Press is delighted to announce that Play or Defend? by Julian Pottage has been named the first winner of the IBPA Bridge Book of the Year award. The International Bridge Press Association made the award public this week at its Annual Meeting, which this year took place in Istanbul, Turkey, alongside the 2004 World Bridge Championships. An international jury of four prominent bridge journalists selected the winner from a short list of six, which included books from the USA, Sweden, the United Kingdom, and Hungary. A second MPP title, Kantar on Kontract by Eddie Kantar, was also named to the short list.